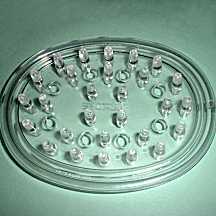 This hygienic soap tray enables the soap to dry quickly, which makes the soap last longer and inhibits microbial growth. 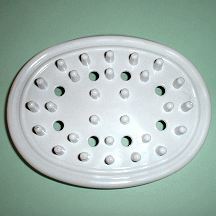 Soap tray may be used alone or placed inside a soap dish. Made in the USA, of durable plastic. Available in clear or white. Tray dimensions are approximately 3.25 inches by 4.25 inches; the perfect dimensions to hold 4.2-ounce regular size or 2.0-ounce guest size bars of soap. Soap trays sell very well at craft shows alongside handmade soap; wholesale prices available.